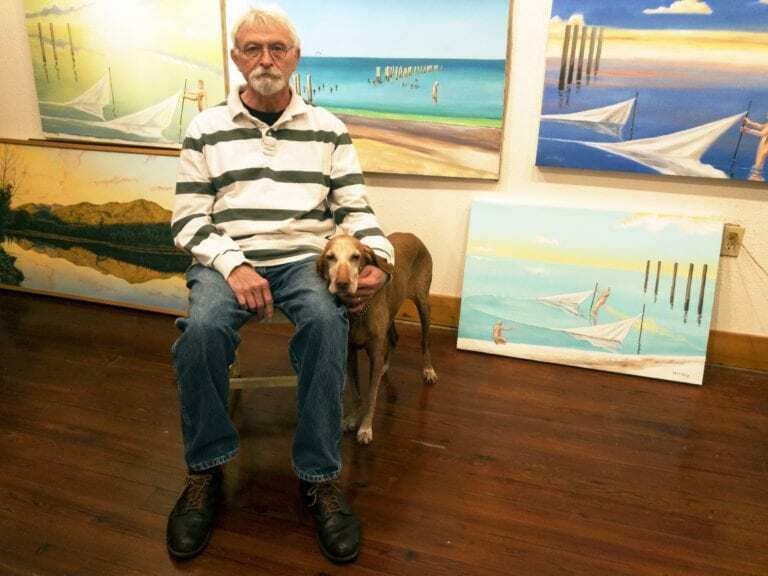 Local artist John Briggs is fully immersed in the fourth major period of his works of art. His newest exhibition, “Casting for the Unknown,” is now on display at the Melvin Art Gallery. Few artists in Plant City are as esteemed and cherished as John Briggs. For decades, his work has ensnared the imagination as he traipsed from masterpieces of realism to breathtaking biblical works to landscapes so pristine and tranquil one felt as if they were sitting on the banks of the very rivers his brush brought to life. Over the past few years he has swiveled again and an exhibit of his massive symbolic minimalism artworks titled, “Casting for the Unknown,” is now on display at the Melvin Art Gallery at Florida Southern College. Courtesy of John Briggs. “Casting for the Unknown” is now on display at the Melvin Art Gallery at Florida Southern College. Though the paintings may be simple in the design they are crafted with such ingenuity that the viewer cannot help but cast their thoughts and perceptions of the world into the very nets loosely held by the abstract figures knee deep in the tranquil waters. With Briggs there is always a deeper story hidden within the depths of his work. He said as a child he thinks he may have been dyslexic, that reading was something he always struggled with. Sports also never came easily to him, but from a young age he was able to pick up nearly every artistic skill he put his mind to. He excelled in music and drawing and fell in love with finding a way to channel his life experiences into works of art. His father cut meats in a small business and Briggs grew up drawing on the butcher paper he found lying around the shop. After serving in the military Briggs used the GI Bill to pursue a masters degree in the arts. He cut his teeth on crafting figurative paintings and then became an exemplary name in the industry with his landscapes. From there he transcended to narrative work and created some exhibits that were 16 feet tall globes telling stories of navigating through a dog-eat-dog world or delving into the terror and despair of spending an eternity in hell. One of his iconic masterpieces, “And We Ran the Road Past the Fourth Wind,” stretches 9’6” by 18’ by 18’ in the top floor of his studio in the heart of downtown Plant City. Now he said he has entered the fourth major period of his work. Seascapes that encompass a figurative and narrative story run in loops through his mind. “Casting for the Unknown” showcases the complexity of this minimalistic feat. Courtesy of John Briggs. Admission to the gallery is free and it’s open to the public until Feb. 22. At the opening reception more than 120 people wove through the gallery admiring the massive works on display. Briggs said everyone seemed to love the collection and many remarked they were “mysterious paintings.” The response on his Facebook page echoes those sentiments as viewers praise Briggs for the uniqueness of each abstract work. Much of Briggs’ work, he believes, is autobiographical. Whether drawing upon memories of his childhood or delving into his passions for nature after watching the destruction of the Everglades his works of art have captured the fervor residing in his soul. It may have taken a long time for his father to understand why his son chose to build a career as an artist, but Briggs said he has never regretted pursuing his gift. Briggs has mastered a variety of skills in the industry and has taught at the Ringing College of Art & Design, the University of South Florida, Disney and Hillsborough Community College. Hundreds of students have sharpened their skills under his tutelage and though he said he is now too old to lead a classroom he is always open to sharing advice for any aspiring young painters. Gallery Hours: 9 a.m. to 4:30 p.m. Monday through Friday. On Display until Feb. 22.